Sinigang is considered as the national dish of the Philippines. There are many ways of preparing this kind of dish and one of the most well-known recipes is Sinigang na Hipon. 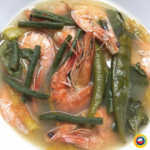 The Sinigang na Hipon Recipe is a sour dish and shrimp is the main ingredient. In a large pan, bring the water to a simmer (almost boiling). Add the tomatoes, onions and sliced radishes and cook until the latter are tender-crisp (half-cooked). Add the green chili peppers, okra, and tamarind juice and continue to cook for another 3 minutes. Add the shrimp and season with salt or fish sauce, to taste. Cook for another 4-5 minutes or until shrimps are cooked and veggies are all tender. Check the seasoning at this point – add more souring agent, fish sauce or even water, if necessary – whatever your taste buds tell you! Stir in the Kangkong or spinach and then cover and let it wilt and cook for a couple of minutes. The steam from the hot soup should cook it quick. Ladle into bowls and enjoy immediately! This video shows another recipe for sinigang na hipon.